The cold weather, the outage of the interconnector and the Cypriot bailout are the main factors in today's report with NBP reaching a seven year high. The EUR and USD conversion rate climbed above 1.30, but is currently struggling to keep its gains. Day-Ahead showed a change of -2.90 £/MWh closing at 74.50 £/MWh and opening at 71.60 £/MWh. NBP prices were at their highest in seven years as a result of the interconnector outage and the sub-zero temperatures and within-day hit close to 150ppt. Front-Month hit a high of 70.7ppt which is uncommon for the season. Day-Ahead power made gains as a result of cold weather forecast and the interconnector outage despite a wind generation of near 10GW. The far curve showed high opening prices before failing due to Eurozone concerns on the Cypriot bailout. The price of Oil and coal fell as the market waits for further news. This morning opened with the Day-Ahead falling to 94.5ppt thanks to the return of the interconnector although further losses were limited due to low storage levels of 10%. Curve prices made gains as Front-Month April saw an additional 0.6ppt to open at 71.3ppt as a cold start to April is predicted, LNG Shipments may ease any supply concerns. Summer-13 opened at £51.15 with an additional £0.15/MWh possibly due to a boost in confidence by the Cypriot bailout agreement. Brent made a gain of $0.83/bbl to open at $107.96/bbl. 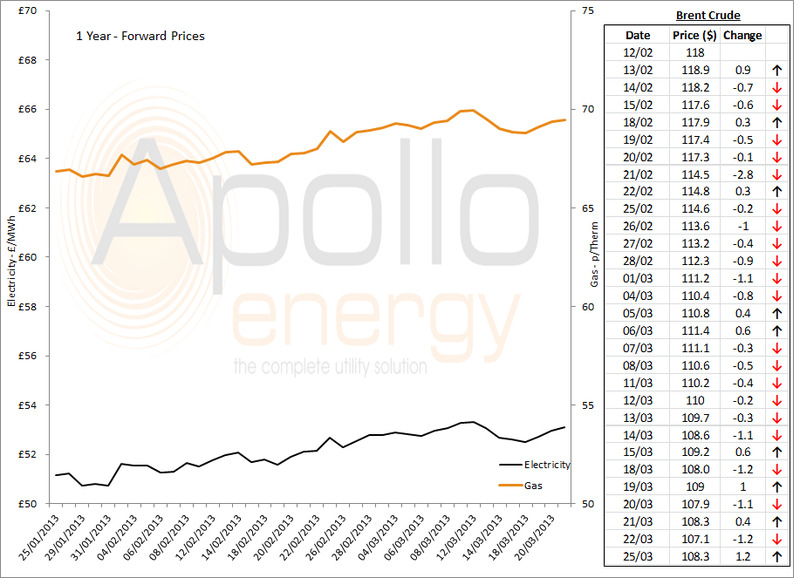 A small rise was registered for the 1-year forward prices of business gas and business electricity, with both of these trading at 69.45ppt and £53.13 respectively. Note: Brent Crude prices are taken from opening market data, and do not represent the price as it changes throughout the day. Brent prices were up and down in a small range on Friday with a drop to 106.8 $/b overnight and then a rebound to 108.37 this morning thanks to the Cypriot agreement.